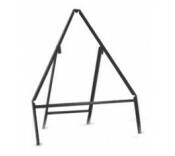 600mm Triangle Manufactured from 25mm x 25mm x 3mm angle mild steel and have folding support le..
750mm Triangle Manufactured from 25mm x 25mm x 3mm angle mild steel and have folding support le..
900mm Triangle Manufactured from 25mm x 25mm x 3mm angle mild steel and have folding support le..
1200mm Triangle Manufactured from 25mm x 25mm x 3mm angle mild steel and have folding support l..
600mm Triangle with a supplementary provision. Manufactured from 25mm x 25mm x 3mm angle mild s..
750mm Triangle with a supplementary provision. Manufactured from 25mm x 25mm x 3mm angle mild s..
900mm Triangle with a supplementary provision. Manufactured from 25mm x 25mm x 3mm angle mild s..
1200mm Triangle with a supplementary provision. Manufactured from 25mm x 25mm x 3mm angle mild ..